Should I Buy, Rent a Home or Just Do Nothing? Buy or rent a home is suddenly a question for me! My plan was always to move one last time to a single level home as I age and can no longer navigate two flights of stairs. I thought this decision would be far in the future because I am a healthy and very active adult (almost 68 years old). So what changed? Interest rates are low and home prices in southern California are not going down! I need to make a choice! I have many choices! I could sell my residence and buy another, rent out my current residence and buy another, or sell my current residence and rent a residence. Since I will have my current residence paid off in less than three years, I may have to take out a small mortgage to buy another residence now. Another limiting factor is the transfer of property tax base for persons 55 and older. Since I have owned my current property for seventeen (17) years, I have a very low tax base and it is advantageous to keep it. In order to transfer my tax base, I must find a property of equal or lesser market value. The replacement property can be up to 105% of the original property value if I purchase within the first year after sale or 110% if I purchase in the second year. The only other limitation is to remain in California. The hardest part will be to find an equal or lesser value property which is a single level. I am at the very beginning of my search and have no idea if I will find what I am looking for. There is one more choice I always have in this process which to do nothing. As I said, I can remain in my current residence for another fifteen (15) plus years before the stairs would be an issue. If I sell and remain in the same general area, I am basically trading dollars. It is what real estate professionals call comps! Comps are a valuation technique in which recently sold asset is used to determine the value of a similar asset. It would be great if I could sell at a high price and I buy at a much lower price. One way to sell high and buy low is find a fixer! For example, I could sell for $600K and buy for $500K and use the extra money to fix it up. There is no limitation as to how much I invest in the home to fix it up and I met the criteria for the law. I could even construct a new home although the requirements stipulate market value versus cost of construction and land acquisition. I am not interested in building a house, but I am not opposed to minor remodeling. Living in Los Angeles is expensive! Unless you have millions of dollars to spend, you will live close to your neighbors. Land is expensive and so are the homes. It is real simple, everyone wants to live here and the supply of homes is limited. 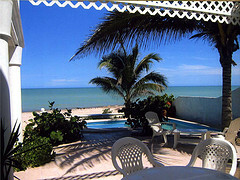 My ideal home is two (2) bedrooms and a den, two and half baths ocean view property. Anything even near the beach is too expensive! I am satisfied to live within thirty (30) minutes of the beach. I would like either something new or under ten (10) years old. I am at the beginning of my search and unsure where this will take me. I did a quick search of available properties and found that many of them are listed for less than what they sold in 2005-2006. I also noticed that they are sitting and not selling. This is probably an indication they are overpriced! Maybe it is not too late to get some of the real estate bargains! I think this remains to be seen. Market prices are determined when they are sold. I am in a great situation because I do not have to move, but I want to move. I have a lot of choices I can always remain in my current residence or rent out my property and rent a residence. I could just about break even and still watch my house appreciate. I think I will take the next couple of months to research my choices and see which one is best for us. Who knows, just remaining in our residence may be the best one. As a lifelong planner, having a number of choices is the best way to buy a home. Funny you should write this: we are thinking along very similar lines. For now, we are doing nothing but we’ll see how things are in four years time. One difference is that we certainly can buy a very nice place for a fraction of what we get for our current house. Still this is our home and it’s difficult to decide. About 20 years ago, I went through the same question before I downsized. With interest rates so low and prices still (somewhat) reasonable, I started to think is this the right time to move (to a single level) home. It may even be the right time to rent vs. buy too. Rents are going up because of a low supply of homes and tighter credit, it may be the right time to rent out my home. I am still thinking about it.